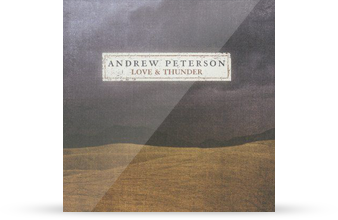 I don’t recall, exactly, how I first encountered Andrew Peterson’s music, but I do recall the moment I realized that I would buy all of his records: I was sitting, listening to Love and Thunder for the first time, and High Noon played. I think I probably played it ten times in a row. Then I started the album over. I did that a few times, too. I really love that album. It feels so complete. That same day, as I recall, I ordered the existing albums that I could, and started watching for preorder info for The Far Country. 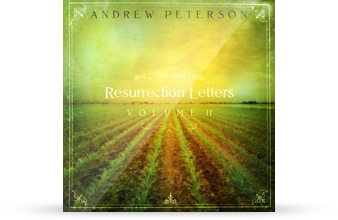 Andrew Peterson’s music often provides a soundtrack for my most important work, whether writing, creating, designing, or reading. It’s music that reminds me what I believe, the stories I want to tell. I love that. I’m going to go listen to Love and Thunder again. When I took my first AP album, Carried Along, to college and blasted it in my dorm room, a girl who lived down the hall came to my door. She was a girl with a reputation, and not a good one. Because of what I had heard about her, my face instantly flushed when I answered the door. I didn’t know of anyone with whom I had less in common, and I was afraid of her. I was sure she had come to smash my stereo with some illegal object, and probably cuss a bunch too. Instead, she would not stop talking about how much she loved your music — how it had changed her life. Inconceivable, I thought. How could songs that were changing me do the same thing for someone on the other end of the spectrum? That was about the same time that lines like “the second coming of the Pharisees” and “all I ever seem to chase is me” were beginning to make a shift in my self-righteous and legalistic heart. God began a very good work in two very different college girls through that one album. And for me at least, every album since (how do you keep making them better and better?) has taken me farther along the path toward grace. Thank you. Ministry can be a lonely job. Even in a healthy church, there are few people in whom a pastor (or pastor’s spouse) can confide. Though I’m open and playful by nature, bumps on ministry road have taught me the wisdom of processing most pain quietly. In this solitude I am afforded a constant companion: music. 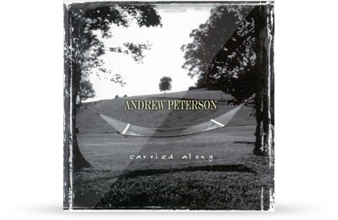 Anyone who thinks that music is a lesser sort of company hasn’t spent enough time with the music of Andrew Peterson. It is like God somehow reaches into Andrew’s songs and puts His love inside there. He implants also His hope, His grace, His listening, His healing, His truth. There are days when I have been too sore and too tired to lift my head. On those days, Andrew’s music has found me, pulsing strength like the sweet winds of heaven. It is difficult for me to explain my gratitude. How do you thank someone for walking into the battlefield to dress your wounds? How do you thank someone for picking you up and carrying you to a safe place where you can rest with Jesus a while? I wish I knew. Someday God when God reveals the mile upon mile of redemption He has accomplished through Andrew, I hope He will let me cheer. Some music becomes a soundtrack to your life during certain seasons. The music that is dearest to my soul is the kind whose poetry and melody become boon companions on my journey, the sort of songs that swing along beside me and brighten what is beautiful or comfort what is broken or just bring the sheer joy of living into my bones. Andrew Peterson’s music has been that for me from the first time I heard it. “Let There Be Light,” especially, was pure joy in my veins and is the song that always heartens me anew for creativity. For me though, the very most precious songs are those that have not only walked along with me, but carried me through dark times with their beauty and tenacious hope. 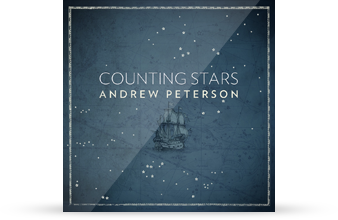 So I can give no higher praise to Andrew Peterson’s whole body of music than to say that it has been a friend to me, a presence that spoke hope into the loneliest times of my journeying, that sang light into the darkness, that took me by the hand and led me to God. I remember one day in particular when I was driving along the highway, feeling grey in heart as the winter sky, and caught in a traffic-jam by a high-speed police chase that had sirens blaring up the other side of the highway and everyone caught. I was just in the mood where I felt there was no hope for the world or myself. Well, guess what song came on right then? “After the Last Tear Falls,” sang out through my speakers with its words about all that is wrong with the world, but then… love. It was as if that love, reaching into time from its home in eternity, was in the car with me. And I’ve felt that many times before with Andrew’s music. Wow. Thank you Andrew, for singing God’s love alive in this world. Call me old school, but when it comes to how I own music that I love, I want it on a CD. I love the convenience of digital music, too, but if I love an artist’s music I want my experience of that music to be more than just a file on a gadget. I want something that I can hold, put on display, and treasure. That’s why I have attempted to acquire the entire CD oeuvre of the acoustic musicians I love the most, and who have loved me by giving me their music. Andrew Peterson is on the top shelf of my Pantheonic collection of CDs (along with Rich, Fernando, Sara, Chris, and others). And yes, I even scored a copy of his debut CD Walk on eBay (mine curiously undated and without a copyright date). I don’t recall precisely when Andrew’s music first entered my life. I’m pretty sure I was tracking with him as early as Carried Along, but it was Love & Thunder that pushed his music into the “soundtrack of my life” status. We were living in the Nashville area for two years, and that 2003 release was the one that got me hooked on AP music. I remember it well, because the song “Holy Is the Lord” (about the sacrifice of Isaac) had so captured my musical imagination that year. The line “Maker of this mountain please make another way” in Andrew’s lyrical and musical retelling of Abraham’s faith made me a believer in the power of his gift of musical storytelling and songweaving. Of course, I was disappointed when it was only a fragment of the song on that album, but I was more than blessed by the “City on a Hill” collection I had to buy to hear his full version (and now I own them all). Andrew’s music has only grown richer and deeper in the decade I’ve been an official AP fanboy. For me, The Far Country moved Andrew into the rarefied air of Rich Mullins musical giftedness, and the music just keeps getting better. Andrew sings the songs of faith that tell me not only who God is, but who I am. His lyrics tweak out the mysteries and majesties of this life of faith in words that remind us all of the beauty and goodness of the God who invented words, and music. When Andrew opens his life in a song, he opens my eyes to God. It is a gift, and we are all blessed by it. Thanks, Andrew. Keep writing and singing your journey. Keep loving God, and us, with your music. Keep pressing on in faith. I first met Mr. Peterson over fajitas at a Mexican joint off I-40 on the east side of Nashville. This was during the early days of the Rabbit Room, the planning phase, in fact, and he was interested in discussing some ways that he and his crew could team up with a group of which I was/am a part. As it turned out, nothing came of that conversation but I distinctly remember the energy and passion with which he spoke of his new project, the same energy and the same passion that still drive his music and his writing and what he has helped build over at the Rabbit Room. Great leaders, great minds, great people, draw others because of their passion and their love, because of their commitment and zeal, because they have vision and faith. I don’t know Andrew well, though he has been influential in my life, and I reckon there’s a good chance he doesn’t remember me well. But I knew at the end of our meal in Nashville those years ago that the Rabbit Room would work because it was clear then, as it is now, that he is the kind of leader and visionary that is worth following. Too much music, whether it’s spiritual or secular, weighs lightly on the scales. But not Andrew Peterson’s work. Whether light-heartedly musing over luggage lost in Kalamazoo (“Isn’t It Love”) or pondering how grace saved an unfaithful husband from throwing away his marriage (“You Came So Close”), his tunes have literary, musical and spiritual heft. 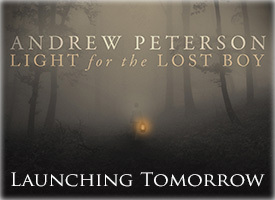 Peterson can evoke childlike wonder with songs such as “Rocket” or find hope despite the darkest circumstances on “In the Night My Hope Lives On.” I’ve never yet encountered an album from him that disappoints, and the arrival of Light For the Lost Boy has me excited indeed. 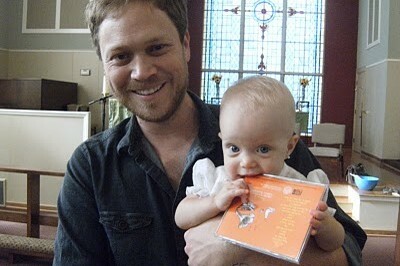 1/2 of my family’s iTunes 25 most-played songs are by Andrew Peterson. For all these reasons, and then some. I don’t even dare look at my iTunes history, because I know AP will dominate it. I’ve been a loyal Andrew Peterson listener since I heard him play at the high school in Bellefontaine, OH, many years ago. I still have the copy of Walk that I bought at that concert, and his music and lyrics continue to be a source of inspiration, comfort, and encouragement. The first AP album I bought was A Far Country. After a single listen I knew I had to own everything he made, and planned to buy anything he ever released. As I started to collect his catalog it was Love and Thunder that made me a die hard fan. Every AP album is amazing, but there was something about Love and Thunder that made me buy half a dozen copies to give to friends and families. And without fail wrecks me every time I hear it. My soon to be (at the time) in-laws had never heard of him. When I played them a few songs, some of them wept (as I always did), and became instant fans. He just has a way of writing songs that feel like they’re for me (or about me). I can easily look back at the many trials over the last 6 or 7 years, and hear an Andrew Peterson song helping me through it. Shifting my gaze from the trial to Jesus. The songs are personal, and they’re often full of aching and longing. But they always point to the One who can satisfy. As big a fan as I am, I have never seen AP live. The closest he’s played is 2 hours from my home in Fairfax, VA. This year BtLoG is playing in Gaithersburg, MD (at one of my church’s sister churches), so I’ll be there. Holding my vinyl copy of Light for the Lost Boy in the air in one hand, and a lighter in the other. Ok, probably not that last part (although I’m sure AP would love it). But I’m going. And God willing, will bring my (about to grow by +1) family of 4. The first time I encountered Andrew’s music was back in 2004 when I was searching for music to incorporate into the Christmas Eve services at my then Episcopal church. I listened through CD after CD of traditional, contemporary, sappy, happy-clappy music. Then I came upon “Behold the Lamb of God”. I put the CD in the player, and was entranced. I sat there and listened to the whole thing. I’m pretty sure the salespeople in the music department thought I’d gone off the deep end, because I remember sounding like I was the “amen corner” at a revival with all my animated “YES!”, and “OH MY GOSH, THAT’S BEAUTIFUL!”, and then came the, “I am doing THIS song on Christmas Eve!”. I couldn’t find any music for the “this song”, though, so I emailed the Rabbit Room. Dear Ben Shive gave me all the tools I needed to be able to share “Labor of Love” that Christmas Eve, and I’m pretty sure Andrew gained a church full of fans. Little did I know then that God was preparing me, through Andrew’s music, to face some pretty big giants over the following 7 years. After my initial encounter with BTLOG, I began purchasing every album I could find by Andrew. “Carried Along”, “Love and Thunder”, and “The Far Country” became staples in my everyday listening. From 2005-2007 the music from these albums kept my nose above water, bringing life to me when there was no life to be seen, in, or around me. I would have to say that Andrew’s music brought me back to life more times than I can even articulate, with the crumbling of my church, the death of my closest brother, the losing of my singing voice through surgery, and the eventual dismissal from actually leading worship. It was just hard to even breathe. And even to the present, there are times when I fall into that old pit of anger, betrayal and grief, and then I listen, and God brings be back to life with a new resolve to see and know the truth. God eventually, through tons of very hard and frustrating work, did heal my voice almost totally. I got to lead worship again in my new church, and I see my brother’s death through new eyes. Not to say that all is well, but it SHALL be well. I want to thank you, Andrew, for stepping up and sharing the gifts God has given you. I’m not sure you will ever know or see the scope of how you have helped so, so many people. Well, I don’t think you’ll ever see it this side of eternity. 😉 I want to say that when you wonder why people (like me) bring gifts to your concerts, or just send you stuff, it’s because of our grateful hearts. We are so, so grateful to you for helping us to heal, and for showing us that we’re all so much alike, and that, indeed, all shall be well.